GLF Schools recognise our moral and statutory responsibility to safeguard and promote the welfare of all pupils and expects all staff and volunteers to share this commitment. We endeavour to provide a safe and welcoming environment where children are respected and valued. We are alert to the signs of abuse and neglect and follow our procedures to ensure that children receive effective support, protection and justice. Child protection forms part of our safeguarding responsibilities. This means that we have a Child Protection & Safeguarding Policy and procedures in place; these can be viewed on the GLF Schools website under the ‘About Us/policies’ section as well as on every school website. All staff (including supply staff, volunteers and governors) must ensure that they are aware of these procedures. Sometimes we may need to share information and work in partnership with other agencies when there are concerns about a pupil’s welfare. We will ensure that our concerns about our pupils are discussed with his/her parents/carers first unless we have reason to believe that such a move would be contrary to the pupil’s welfare. 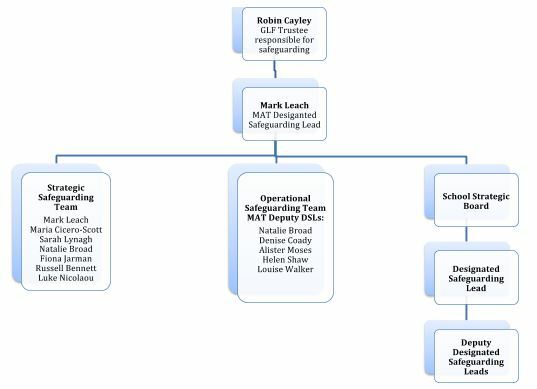 Each GLF School has a Designated Safeguarding Lead (DSL), contact details are published on each school website. The school DSL is the person responsible for all safeguarding within that school. If you are concerned about a child’s welfare, please record your concern, and any observations or conversations heard, and report to one of the Designated Safeguarding Leads (DSL) as soon as possible the same day. Do NOT conduct your own investigation.